Service Your Own Car & Empower Yourself ! 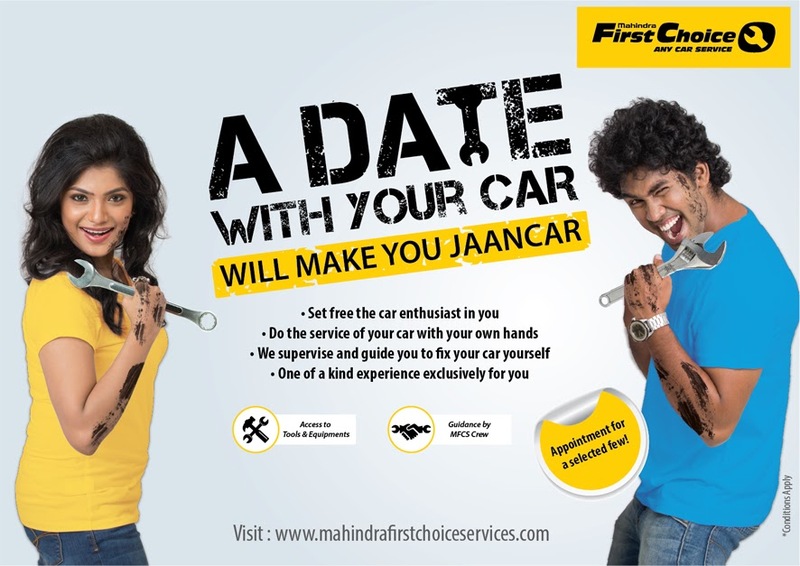 Mahindra First Choice Services (MFC Services), India’s largest chain of multi-brand car service workshops, and part of the US$19 billion Mahindra Group, has launched a unique initiative ‘A Date with your Car’ that will set free the car enthusiast in you. This one-of-a-kind experience will give car owners an opportunity to service their cars themselves. The idea behind ‘A Date with your Car’ is to give customers a hands-on experience of their cars under the guidance of MFCS technicians and to empower them with the information they need when making car-servicing decisions in the future. The car owners can come to the workshop on an appointed day and service the car themselves. Throughout the session, trained MFCS crew will be available for consultation and help customers fix their car. Customers will also get access to all the tools and equipment needed for undertaking the service job (under MFCS guidance) and no labour cost will be charged. This program will only undertake regular and basic work. To participate in this exclusive appointment-based activity customers can log on to www.mahindrafirstchoiceservices.com for registration. Mahindra First Choice Services is equipped to offer complete car maintenance & service solutions, from body repairs to wheel alignment and balancing to periodic maintenance services and it offers branded generic spares. The franchisee workshops have skilled technicians to handle service needs of all cars especially those of Maruti, Hyundai, Tata and Mahindra which constitute approximately 79% of the car services market. With over 340 workshops across 24 States, MFC Services is steadily marching towards its vision to be amongst the top 3 service providers for out of warranty cars by 2018. The company is constantly enhancing the customer experience through digitization and has launched CARWORKZ a car servicing workshop aggregator. It is also exploring partnerships with insurance companies and fleet operators to increase the inflow of customers into franchisee workshops. It aims to grow its network to 1,000 workshops across the country. The company also provides cashless insurance facility with leading insurance companies and a convenient booking service for customers. Car owners can book a service either by calling the workshop or the toll-free number 1800-22-4008 or through the website www.mahindrafirstchoiceservices.com. The website offers a host of features like car dent estimator, roadside assistance and warranty beyond warranty.